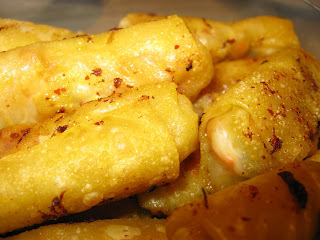 So, on a whim, I embarked on an egg roll journey and used the knowledge and technique I learned at Paulino’s to create some delicious pastelitos with more of an Asian flair. I sautéed onions, julienned carrots and some savoy cabbage, just simply with a little bit of olive oil, salt & pepper. 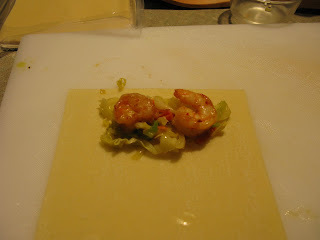 Then I sauteed peeled, deveined shrimp with olive oil, pepper, and a little bit of Jin Ji’s Happy Hot Sauce. 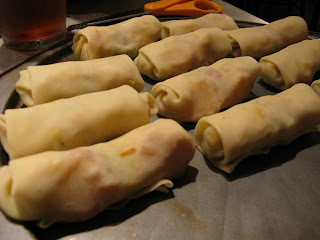 I put it all together in some egg roll wrappers, and shallow-fried them in olive oil. Don’t worry — the oil wasn’t dirty — the bits on the outsides are from the residual Happy Hot Sauce in the pan. I served them up with a carrot and savoy cabbage slaw — dressed with soy sauce, lime juice, peanut oil, sesame oil, and toasted sesame seeds. Yum!